Equality and inclusion are at the core of our charitable aims and we are committed to working to remove economic, social or geographical barriers that might prevent young people from accessing our opportunities. Our Bursary Fund awards over £650k worth of support every year to ensure that financial barriers don’t prevent young people from engaging with our opportunities and young people can apply for a bursary to cover audition fees and travel costs, course accommodation costs and fees and subsistence whilst taking part in our activity. 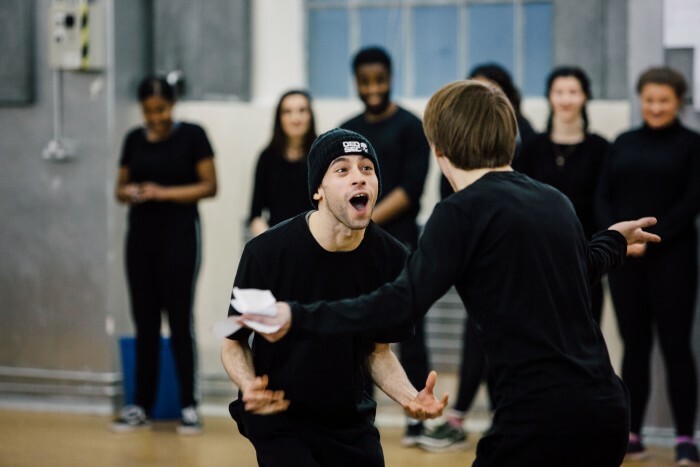 We offer a wide-range of free targeted opportunities, designed to reach young people who face financial, social or geographical barriers that prevent them from accessing high quality drama. We also never charge a young person a fee to be in one of our productions. You can find more information on our free opportunities below. Our dedicated Bursary Fund provides £650k worth of support every year to young people taking part in our auditions and backstage interviews, summer membership courses, productions, projects and free long-term training programmes. Young people can apply for a bursary to cover audition fees and travel costs, course travel, fees and accomodation and subsitence whilst taking part in our courses or productions. We never charge a young person a fee to take part in a production and are committed to offering over 250 opportunities, outside of our REP and Playing Up companies, every year for young people to peform on stage at leading venues. Launched in 2007, our free flagship social inclusion course Playing Up is a part-time accredited 9 month drama training programme for young people aged 19 - 24 not in education, employment or training or at risk, leading to a Level 3 qualification. As well as drama training, Playing Up students receive travel bursary support, free theatre tickets, pastoral and academic support, a professional industry showcase, help applying for higher education and free drama school auditions. Playing Up offer vital second chances to young people to get back on track. New to 2019, Stepping Up is a free accredited 3 month training programme leading to a Level 2 qualification. Our Stepping Up students also receive a travel bursary, pastoral care to support their learning and progession routes within NYT and beyond. Inspired by the traditional repertory theatre model, the NYT REP Company is a free alternative to formal education offering practical, industry-based full-time talent development in drama and performance over nine months to 16 NYT members, who also receieve bursary support amd subsistence. Launched in 2012, over 100 18-25 year old members have taken part in this unique free opportunity. The Bryan Forbes Assistant Director Bursary offers one early career director each year aged 18-30 the chance to train alongside the REP Company, supported by a £10,000 bursary. As part of Islington Council's 'Islington Pledge' we are offering to waive audition fees for 2019 acting auditions and backstage interviews for young people who are UK residents, live in the Borough of Islington and meet the criteria specified here. Outside of Islington in the last two years we've also partnered with arts charity Arts Emergency and Batley and Spen Youth Theatre to offer free auditions. 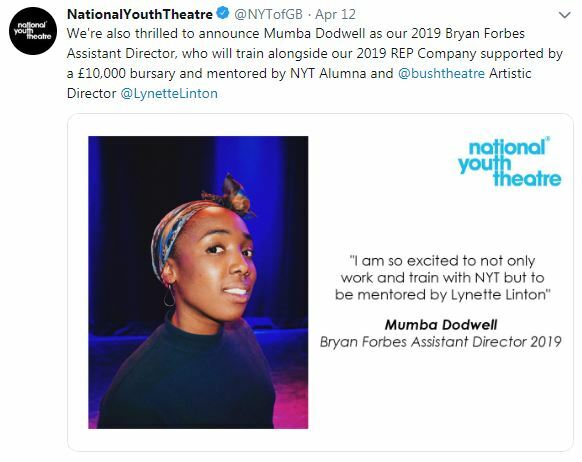 A £10,000 bursary,mentoring from an industry professional, the opportunity to train for free with the NYT REP Company for 8 months full time and the chance to assistant direct and direct NYT REP productions. Apply. Free training in drama facilitation and safeguarding best practice for 600 NYT Members every year. Find out more. Since 2018 we've been working in partnership with Diverse City and Highshore School on our Inclusion Project, dedicated to making NYT more accessible to disabled and neuro diverse young people. Through this programme we've created free workshops, performance opportunities and auditions for the students, as well as career development opportunities for our members. As part of the programme Highshore students and NYT Members performed with Extraordinary Bodies at the National Theatre in What Am I Worth?. Once you've completed an NYT Summer Intake Course you become an NYT Company Member up until the age of 26. Annual Company Membership costs £35 a year (bursaries available). As a Company Member you can access a whole host of opportunities from NYT Casting Auditions to free and discounted theatre tickets, free NYT workshops to external casting opportunities, and our Creative Leadership programme offering a range of creative development opportunities which can lead to paid employment with the organisation. From 2018-2021 we're working in West Norfolk as part of the Youth West partnership, delivering free workshops, auditions and activities to local young people in the area. In 2018 we ran a five week open access course for 14-17 year olds in Kings Lynn. Over the past few years we have worked on numerous outreach projects across the UK, including ShortFlix a free film initiative designed to discover and nuture talent from backgrounds under-represented in the industry in partnership with Creative England and Sky Arts, a YouTube series featuring young talent who identify as LGBTQI+ and Wherever I Lay My Head - a project with young refugees exploring the disruptive impact of trauma on the young people’s lives, particularly on their ability to sleep.